When I was a teenager I went to a rugby-mad all-boys school. But I was the captain of the debating team and liked to do magic tricks. Needless to say, I didn’t exactly fit in! And as we all know, fitting in is important for teenagers. But I was the captain of the debating team and liked to do magic tricks. Needless to say, I didn’t exactly fit in! And as we all know, fitting in is important for teenagers. That’s why it’s no small thing for a teenager to stand up, and stand out, as a Christian. The young person at school who claims Jesus as Lord won’t always have an easy time of it. They need help and encouragement. Enter Unshakable, a book made up of articles from fervr.net. It’s been put together for teenagers who have made the brave decision to follow Jesus and it considers four broad areas: faith, church, life and future. The short articles/chapters cover everything from “How do I talk to God?” to “Are you ready to start dating?” and “What if I fail my exams?”. Let me tell you three things I liked about Unshakable and who I think would get the most from it. 1. It’s a practical book – full of the gospel. 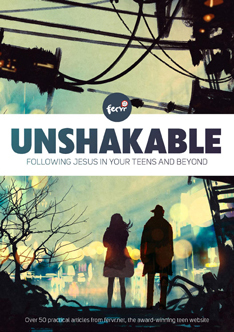 Unshakable does what it aims to do: help teenagers see what the Christian life looks like in the world they are living in. There are plenty of practical suggestions and ideas such as how to start a gospel conversation, how to avoid sexual temptation and what to remember in times of suffering. 2. It’s a punchy book. I assume because these chapters started out as blog posts they are short, sharp and to the point. Most of them deal simply with one issue or answer one question. This makes the book easy to read and easy to dip in and out of. I gave my copy to my 13-year-old, who immediately found and flicked to the chapters that interested her most. 3. It’s a book that pushes forward. At the end of every section, there are suggestions for further reading. These range from recommended blog posts right through to some evangelical classics like J.I. Packer’s Evangelism and the Sovereignty of God. For teenagers who are keen to dig deeper, these reading lists will push them on in the right direction. Obviously, this book is aimed at teenagers. Anyone in my youth group could read it and benefit from it. But I think there is a second audience for this book: people like me who are involved in ministry to youth. Unshakable gives me some model answers to tricky questions, as well as helpful metaphors and practical suggestions/applications as I aim to teach and encourage our youth to live for the Lord.